2. Mix flour, sugar, baking powder, and salt together in bowl of electric mixer at low speed. Add butter and beat at low speed until mixture resembles moist crumbs, with no powdery streaks remaining. 3. Add all but 1/2 cup of milk mixture to crumbs and beat at medium speed (or high speed if using handheld mixer) for 1 1/2 minutes. Add remaining 1/2 cup of milk mixture and beat 30 seconds more. Stop mixer and scrape sides of bowl. Return mixer to medium (or high) speed and beat 20 seconds longer. Stir in 1 cup mini chocolate chips. 4. Divide batter evenly between three prepared cake pans and using rubber spatula, spread into even layer. Arrange pans at least 3 inches from the oven walls and 3 inches apart. (If oven is small, place pans on upper middle and lower middle racks in staggered fashion to allow for air circulation.) Bake until thin skewer or toothpick inserted in the center comes out clean, 21 to 25 minutes. 5. Rest cakes in pans 10 minutes, then loosen from sides of pans with a knife. Invert onto large plate, reinvert onto wire racks. Cool completely, about 1 1/2 hours. 1. 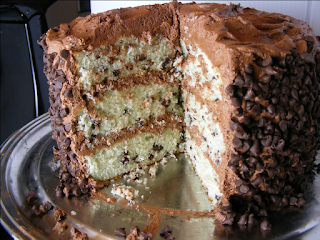 With electric mixer fitted with whisk attachment, beat butter, melted chocolate, vanilla, and salt on medium-high speed until combined. Reduce speed to medium-low. With machine running slowly, add confectioners' sugar and mix until smooth, about 1 minute. Increase speed to medium-high and beat until light and fluffy, 3 to 5 minutes. 2. To assemble: Place 1 cake round on serving platter. Spread 3/4 cup frosting over cake, then top with second cake round. Spread another 3/4 cup frosting over cake, then top with third cake round. Spread remaining frosting evenly over top and sides of cake. 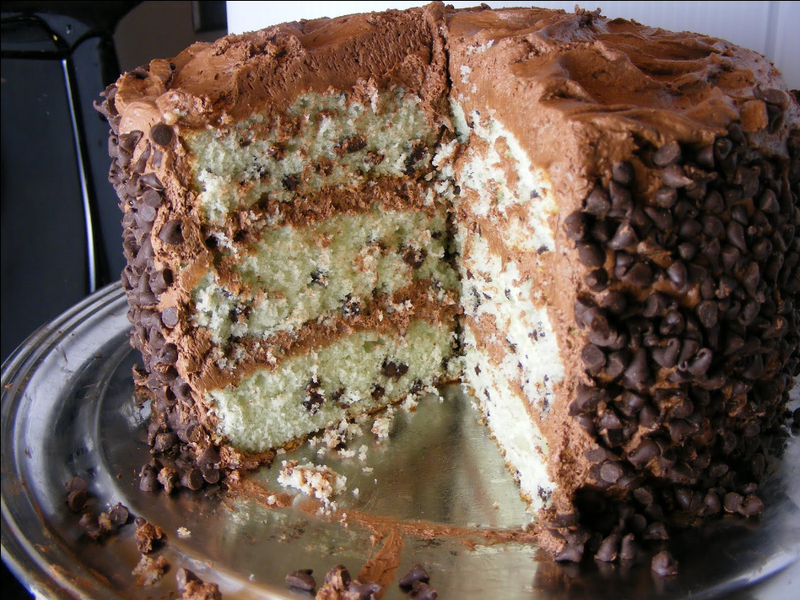 Press mini chocolate chips onto sides of cake. Serve.